Start in Delhi from there goto Jaipur in Rajasthan which is 5 hours by bus or train. Visit the important temples in Jaipur. Onwards take a 6 hours train or bus to Mathura and Vrindavan - the land of Lord Krishna. You can visit a number of temples such as ISCKON and Bankey Bihari and Mathura - the birth place of Lord Krishna. You can take a train from here to Lucknow and NaimiSaranya where the Srimath Bhagavatam was spoken by Suta Goswami. From Lucknow to Ayodhya take a 4 hour bus and visit the birth place of Lord Rama. From Ayodhya carry on your journey to Allahbad where the famous Kumbh-Mela is held at the confluence of the Ganges, Yamuna and Saraswati rivers. A five hour bus trip will get you to Chitrakut where Lord Rama lived in Exile for 11 years. Take an overnight train frm Chitrakut to Varanasi. Varanasi is a important holy place for Hindus. You can also take a site trip to Sarnath. Bodh Gaya the land where Lord Buddha attained enlightenment is about 7 hours away by train. This is an important pilgrim place for all Buddhists. From Gaya you can get a overnight train to Calcutta, where you could continue your journey to Puri which is a land of beautiful temples and Mayapur which is the birth place for Sri Chaitanya and houses one of the largest ISCKON temples in India. The Char Dham yatra takes 11-18 days and includes the holy cities of Haridwar, Yamnotri, Gangotri, Kedarnath and Badrinath. Every year millions os pilgrims go to Haridwar and Rishikesh and then take a side trip to Badrinath. Enroute Haridwar you can stop at Kurukshetra, the famous battle field where the Bhagvat Geeta was spoken. Another famous holy is that of Amritsar where millions of devotees living in India and abroad visit the Golden Temple every year. The home to the Dalai Lama is at Dharamsala. Several Buddhist devotees visit this place every year. 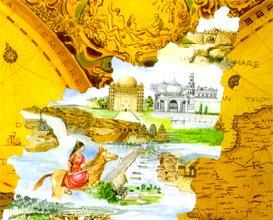 Start your journey in Jaipur where there are several temples. Take a 3 hour bus to Pushkar which has a sacred lake and one of the only temples dedicated to Lord Brahma. There is an yearly Pushkar fair held here. The famous Nath Dwar temple near Udaipur is the home of the famous Nathaji deity. From Udaipur 7 hour bus takes you to Mount Abu which has several beautiful temples. From Mount Abu you can goto Ahmedabad and Dakor where there is a famous temple dedicated to Krishna called the Ranchorji temple. From Ahmedabad you can also take a 10 hour train to Dwarka or Somnath. It is said that Lord Krishna lived in Dwarka and left this material world at Somnath. Start your journey in Chennai and goto Tirupati where there is the famous Balaji temple. You can also vist Kanchipuram which is the famous temple town. A visit to Mamallapuram which is famous for it's ancient rock carving temples. You can then head south by train or bus to Sri Rangam (Tiruchirappallai) where there is one of the major Vishnu temples of India. Chidambaram has a famous deity of Lord Shiva dancing on one foot. You can also stop at Thanjavur which has a famous Shiva temple or Kumbakonam which is a small temple town. From Sri Rangam you could head to Madurai to visit the famous Meenakshi temple. You can also find a few important Vishnu temples. A side trip can be taken to Ramshvaram which is where Lord Rama crossed the ocean to goto Lanka. There is a famous Siva temple here and it is said that the Siva Linga has been installed by Lord Rama and Seeta. You can then goto Tiruvananthapuram which is seven hours from Madurai. There is a famous Vishnu temple here. You could take a side trip to Kanyakumari - the southernmost point in India. Udupi is famous for the Krishna deity installed by Madhvacary. You could also go upto Hampi and Badami which are both important temple towns. This entire trip will take you about 20 days. Start in Puri which is in Orissa and stop at Bhubaneshwar which has beautiful Hindu temples. From there head south to Vishakapatnam and goto the famous Narasimha temple at Simhachalam. On the way you could stop at Sri Kurman and visit the only Kurma temple in India. From there visit Vijayawada and visit the famous Narasimha temple at Mangalagiri. Then onwards to Hyderabad where there is an interesting Narasimha temple 60 kms north of Hyderabad at Yadagiri-Gutta. Carry your journey onwards - visit the Siva temple at Srisailan. From Hyderabad you could also visit Ahovalam where there are nine deity forms of Lord Narasimha. From Hyderabad you could head towards Mumbai which has several important temples even though it is a metro city. One of these temples is that of Lord Ganesha - Siddhi Vinayaka. It also has the famous Maha Laxmi temple. A few hours from Mumbai will get you to Shirdi which is visited by millions of pilgrims fom around India every year. Nasik, another city in Maharashtra which is famous for "Panchavati" which is related with Lord Rama's exile.